Image: Ron Thomas/Getty Images. Design: Ashley Britton/SheKnows. I am a San Diego native — a bit of an urban legend, I know. I grew up in a town called Oceanside, about 30 miles north of downtown San Diego, and I’ve lived in the seaside town of Carlsbad with my two daughters (now 11 and 13) for the past 12 years. I can’t even begin to imagine a better backyard for kids of all ages to explore. 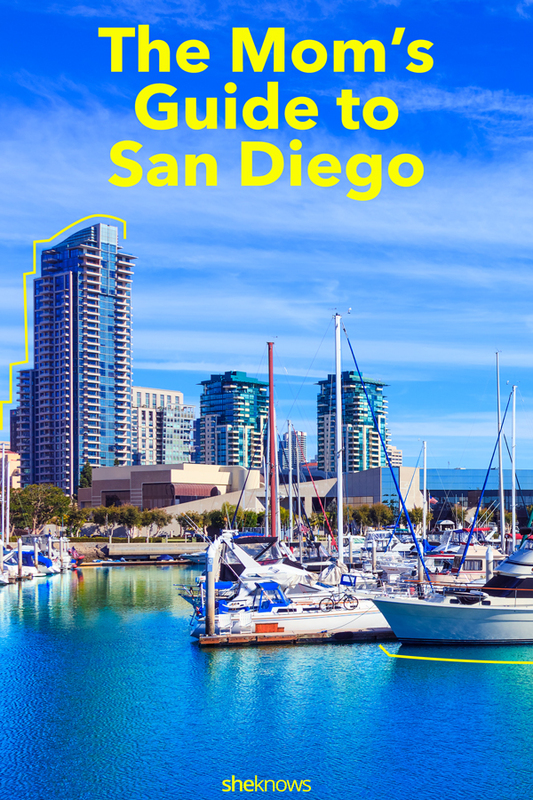 An oasis for outdoor activities year-round, San Diego is an ideal family vacation destination in November — and honestly, virtually every other month of the year. As I write this, the weather is 72 degrees and gorgeous. Seriously: Pack your bags, your kids, and get over here. Here are all the best spots to check out during your visit to San Diego — at least according to this family of locals. Image: Courtesy of Jamie Werner. San Diego is home to 31 beaches, and even if you visit a new beach every day for a week, you can’t go wrong. Coronado Beach, voted one of America’s finest stretches of sand — and home to the infamous Hotel Del Coronado — offers expansive dunes on which to play and chill. You can lie on the beach and watch planes fly overhead (they get pretty darn low) and land at nearby Naval Air Station North Island. Head about 18 miles north to La Jolla to visit the Children’s Pool; here, you will not necessarily want to swim in the ocean, but you can watch tons of seals in their natural habitat — bathing, basking and even giving birth to their seal pups. Drive about 20 more miles, and you’ll arrive at the seaside surfer town of Encinitas, where the fantatic and family-friendly Moonlight Beach offers a playground for kids. Plus, this seaside locale is very close to downtown Encinitas on the 101, with plenty of shops and restaurants that will entice all ages. Want to combing beachcombing and hiking? Look no further than Torrey Pines State Natural Reserve. Set on 2,000 acres of coastal state park in the community of La Jolla, the reserve overlooks the Pacific Ocean and is juxtaposed against sandstone canyons and windswept cliffs. Torrey Pines offers visitors true coastal wilderness within the 8 miles of trails ranging from easy to moderate. Hiking down to the beach from the cliffs is an invigorating experience. A few times, we even saw whales swimming in the distance. For baseball fans, Petco Park is the most gorgeous stadium to catch a game. 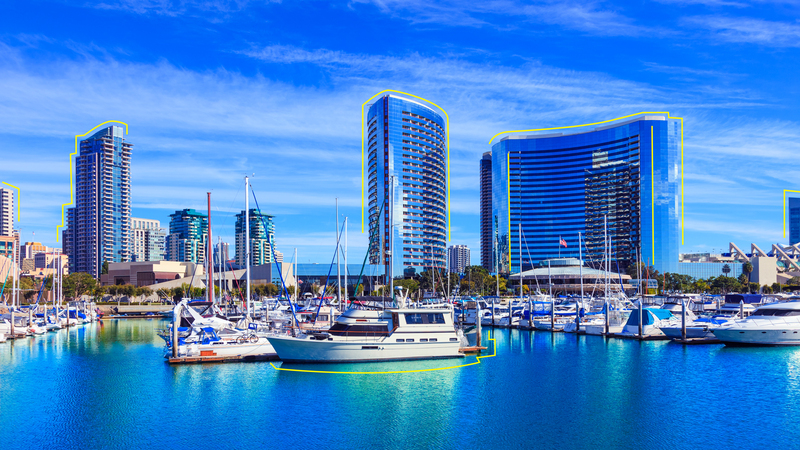 Located in the heart of downtown San Diego, the stadium has stunning views of the bay and is easily accessible by foot, car or trolley; kids love taking the latter around town. You can also hop on the trolley and stroll Old Town for some San Diego history dating back to 1824 (including 32 restaurants, hotels, shopping and museums). The New Children’s Museum, also downtown, is a great place for families with younger kids. From interactive activities to art installations, tots will have a ton of fun exploring the center for hours. And for anyone looking for some maritime adventure, look no further than the nearby USS Midway. San Diego is a naval town, after all, and the USS Midway offers a history museum on the actual aircraft carrier Midway. Explore galleries and flight decks and even go below deck to see the inner workings of an aircraft carrier. Go to Farmer & The Seahorse on any given Sunday, and you’ll see plenty of kiddos running in the private grassy lawn and playing lawn games with their caregivers. Located nearby Torrey Pines Reserve (yep, head here after your hike), the eatery features an approachable menu with plenty of options that little ones will love, including the kids waffle topped with fresh berries and whipped cream. When you’re in Encinitas, be sure to stop by one of our favorite gourmet sandwich shops, Moto Deli. With an outdoor patio and a low-key motorcycle vibe, it’s a chic family favorite; try the turketta sandwich and fried pickles while you’re at it. The Reuben is amazing, and if you are looking for a meatless option, go with the Impossible Burger. The local craft beer selection here is always changing, and they recently added hard kombucha to boot. For a sweet treat in Encinitas, you mustn’t miss Hendel’s Homemade Ice Cream. There’s a veritable array of house-made flavors, and choosing can be a bit overwhelming. There is also often a line out the door (but the ice cream is totally worth the wait). Herb & Eatery, the casual market attached to Brian Malarkey’s Herb & Wood, is a gem for all-day fresh fare. Located in Little Italy near downtown, Herb & Eatery offers a menu of salads and sandwiches, plus a selection of entrées and appetizers at lunch and dinner. At breakfast and brunch, guests can dive headfirst into freshly baked croissants from executive pastry chef Adrian Mendoza along with house-made bagels with lox, smoothies, house-made kombucha and fresh-pressed juices. 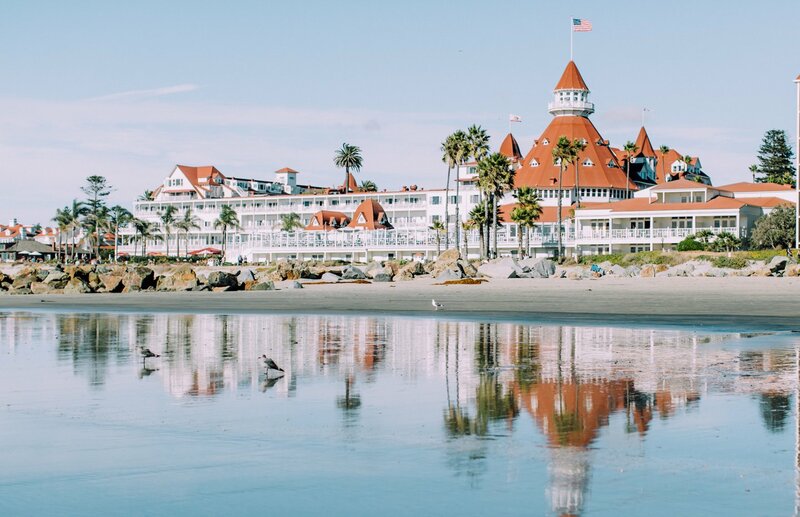 Back at the Hotel Del Coronado, you can rest your weary heads (and beach feet) in an upscale beach hotel housed in a grand 1888 Victorian property. Just steps from the beach, the hotel offers a huge pool, a large grassy area where kids can play, an ice cream shop and tons of restaurants — and it’w within walking distance of the quaint town of Coronado. Surfhouse is the recently renovated boutique beach motel in Leucadia that gives 100 percent SoCal surf vibes. It’s located one block from the beach, so take the opportunity to rent bikes or take a surf lesson. For a more luxe stay, you can’t go wrong with the Omni La Costa Resort & Spa. It’s complete with world-class spa, golf course, tennis courts and kid-specific pool areas featuring two 100-foot waterslides, and a toddler slide.